EETAsia: The technology incubator division of Royal Philips Electronics has spun out Silicon Hive, a licensor of processor and related IP. As part of the deal, New Venture Partners, TVM Capital and Philips have together invested $10 million in the new company. Philips retains a minority stake in the newly created Silicon Hive B.V.
Silicon Hive specializes in imaging and high definition video signal processing IP, among other things. There is also 2006 3GSM presentation on-line. Yahoo-MarketWire: DALSA board of directors approved the appointment of Brian Doody to the role of CEO. Savvas Chamberlain will continue to chair the board of directors in the role of Executive Chairman and will continue to advise on the strategic direction of the Company. The image sensor business management is also reshuffled: Edwin Roks has been appointed to the position of Vice President and General Manager of the new Image Sensor Business, which combines the Professional Imaging and CMOS IC Business Units. Dr. Roks will report to Ralf Brooks, President of DALSA Semiconductor. Dr. Roks has been with DALSA since 2005 as General Manager of the CMOS IC Business Unit. Prior to that he was CTO of Philips Polymer Vision and R&D Director of Philips Imaging Business Line. Forbes: ProMOS and Cypress are ready to establish a joint venture for CMOS image sensor design in June or July, as Commercial Times writes. The newspaper quoted ProMOS chairman Chen Min-Liang as saying his company is set to take a stake of over 80% in the venture. The joint venture is expected to introduce its first products by the end of this year at the earliest, Chen was quoted as saying. In January, Chen said ProMOS was ready to diversify over the next five years, keeping the production of DRAMs as its core competence, with the planned CIS subsidiary overseas playing a complementary role. "IBM CIMG7SF provides a competitive sub 3.0 μm, 4-transistor (4T) pixel architecture with an optimized transfer gate, which is suited for mobile camera phone and digital still-camera applications. CIMG7SF also provides large reference pixels for high-end digital still camera and emerging applications. The offering includes state-of-the-art microlenses and color filters for exceptional quantum efficiency and angle response, along with pinned photodiode technology for reduced dark current. This technology uses aluminum wiring for the last metal level and copper wiring for the remaining metal levels. With thin back-end-of-line (BEOL) metal stacks and improved dielectric tolerance, CIMG7SF is suited for multiple imaging applications." 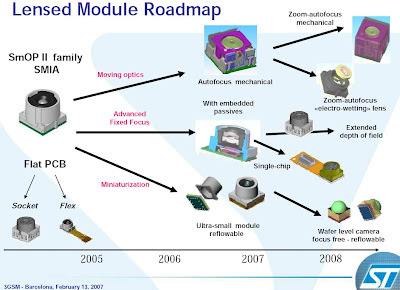 CMOS Imagers: How Did We Get Here and What’s Next? Local press usualy support local businesses. But not this time. Idaho Business Review seems to take part in the fashionable critics of Micron. 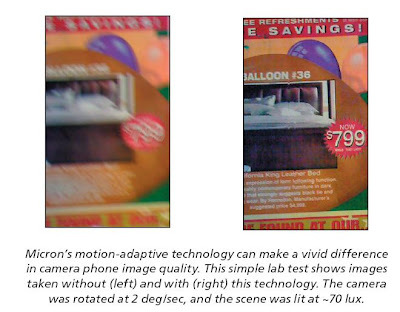 The object of their critics is Micron's new anti-shake sensor PR. They dont like many things - starting from its timing all the way to the claims. 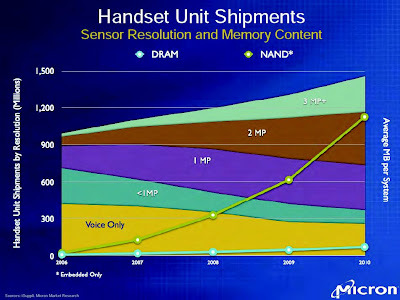 To me Micron's PR is quite similar to others, like Omnivision, Samsung, ST. This tendency to find yet another reason to bite Micron is all over the net these days, but Idaho Business Review case is the most ridiculous one from what I've read. Digitimes: USB designer Alcor Micro has acquired a 77.27% stake in image sensor developer Taiwan Advanced Sensors Corp. (TASC). The acquisition was worth 77.19 million (US$2.33 million), according to an Alcor Micro filing with the Taiwan Stock Exchange. Virtual Press Office: Dongbu Electronics leads foundry industry in development of ISP "design library", available at no charge to Dongbu customers. It's not clear what it means by "design library". Is it a complete IP block or just few parts of ISP? The library supports color balance, AE and AF operation and also "enhances resolution of CMOS image sensors". It's internally designed by Dongbu engineers in 0.13um process and now they are porting it to 0.11um node. 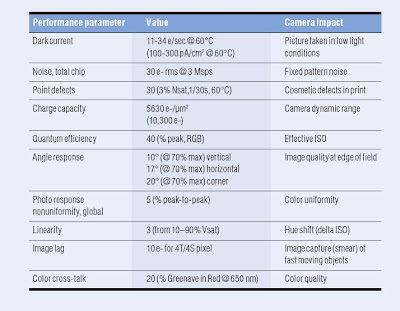 Vision Systems Design published an article "Trends in CMOS and CCD image sensors". Written by Awaiba founder Martin Wäny, it's naturally biased toward mashine vision and scientific applications. It presents quite a good overview of the latest developments in the area, like a blending border between CMOS and CCD technologies, combined CCD-CMOS imagers by Fairchild, electron multiplying CCD by e2V and single-photon avalanche diode imagers by Swiss Federal Institute of Technology. Virtual Press Office: The Swiss Center for Electronics and Microtechnology (CSEM) introduced a wireless version of its innovative miniature ViSe vision sensor system. The ViSeLink system is composed of the ViSe camera vision sensor and digital signal processing chip (DSP) that runs identification algorithms. The system speeds throughput of visual data by enabling the vision sensor chip itself to extract key image features needed for interpretation, prior to sending it for software processing on the DSP. Using recognition of moving forms, the system can distinguish between human versus animal intruders, can spot elderly citizens falling, distinguish people carrying unconcealed weapons, and identify small children, roadway markings and other shapes. The ViSe sensor in the heart of the system has 160x128 pixel resolution with 50um pixel pitch. The pixel fill factor is just 8.7%, probably due to the integrated pixel functionality. The sensor uses 1.75um pixels and has a huge 24.99deg chief ray angle at 80% of image hight. Pleliminary SNR and DR are stated as 38db and 67.4db respectively. This roughly translates to ~3e noise floor. The power consumption is 150mW in 30fps preview mode. General customer sampling is planned for August 2007 with mass production expected in the Q4 2007. Micron bad news are in fashion these days. TheStreet.com writes that Micron "reportedly had a full quarter's worth of finished image sensors in stock. 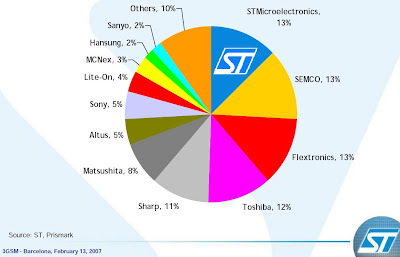 According to analyst Doug Freedman of American Technology Research, the division accounts for 25% of Micron's profit." Google Video presents a nice set of lectures on various photography topics, including image sensors, for those of us who has a plenty of time to watch. EETimes: SMIC plans to expand the capacity of a 200-mm wafer fab in Chengdu from 20,000 wafers per month to 70,000. The fab, known as Cension Semiconductor Manufacturing Corp., will start pilot production this month and mass production in June. SMIC manages Cension for local investors in Chengdu, including government entities. Cension will produce CMOS image sensors, among other products. The 2010 market looks almost evenly divided between 1MP, 2MP and 3MP models, all of them displacing voice only and below 1MP phones. However, voice only phones keep quite a large market share even 3 years from now. Thanks. Finally, can you tell us what your sensor -- give us an update on your sensor business and tell us what it did sequentially or what percentage of sales it is now? In terms of percentage of sales, it is in double digits, between 10% and 15% of total sales. We had negative growth quarter over quarter in both unit shipments and revenues, and I would attribute that to probably three factors, and I will list them in order of significance. Number one would be the impact of the seasonal slowness in demand, if you will, as well as some inventory accumulation to some of our customers occurred, both with mobile phone units themselves as well as semiconductor components. 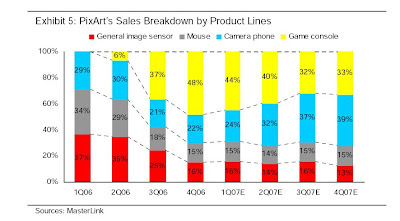 The second would be the increased competitive environment in the CMOS image sensor area. I believe we have lost a bit of market share, as we have seen some pretty aggressive competition from a variety of different players. Number three would be this phenomenon of very low-end mobile phones kind of encroaching on the camera-embedded portion of the mobile phone business. We are basically seeing kind of a near-term retrenchment in camera phone penetration as a result of the growth of the markets, specifically in India and China, of phones without cameras. Do you feel like you are seeing a bottom in terms of orders and excess inventory out there? How should we think about your sensor business looking forward? It is going to be tough for us to replicate the kind of growth that we had in place for the last couple of years -- no question about that, as a result of two of those factors that I mentioned earlier, the competitive environment as well as the low-end phones. We are seeing our camera module integrators, we believe now they are flush on inventory. In other words, they have worked off the inventory that they have accumulated through Q4 and the first part of Q1. In terms of whether we can get, how quickly we can get back to the levels we were going out of 2006, difficult to say. The first question to follow-up on the image sensors, if you could give us a bit of granularity on what profitability did with revenues down in the quarter, and how should we look at this going into the May quarter? I will have follow-ups. Thank you. On imaging, we ran low 40% last quarter and we were mid 30’s this quarter. Great, and next quarter, should we think about this for the business [assuming] a bit of revenue growth maybe or flat for revenues in the May quarter? We are going to stay away from guiding gross margins. It is not something we have historically done for any of our segments. Daniel Amir - WR Hambrecht + Co. Thanks a lot. A couple of questions here on the image sensor side. What was the percentage of your one-megapixel and above revenue unit and what is the VGA mix right now? Okay, on the mix by pixel density in the quarter we completed, about two-thirds 1-megapixel and above, and that would be split roughly 50-50 at 1-megapixel one-third, and two and above about one-third. That leaves VGA at about one-third as well. In the quarter that we are in, by the way, I am not sure if you asked the question but in the quarter that we are in, I would anticipate the mix is probably going to be roughly in line with that. You did ask a second question. I did not catch it. You answered both my questions but then the other question is related to the inventory situation on the image sensor, how long do you feel that this is going to take until you are back to more of a normal ordering pattern? Well, I think you are asking two questions. The normal ordering -- the inventory position, we are heavy, as we mentioned in the opening comments. We are at about a quarter, slightly more than a quarter’s worth of finished goods inventory. We have made adjustments in terms of our wafer inputs to get those back in balance, and our assumptions are we are going to be roughly in balance going out of our current fiscal year, so it is another quarter-and-a-half until we are where we want to be in terms of inventory mix. Now, having said that, lots can change. We have proven that we are not experts at predicting how quickly the business is going to expand or how quickly it may contract due to inventory problems, so that could change. But given the scenario that we are looking at right now, it looks like it is going to be about the end of the fiscal year before we have inventories back in balance of where we would like them to be. Thanks for taking my question. I was wondering if you could comment on how much image sensor pricing was down sequentially in the February quarter. And then also, you mentioned that you felt like your customers had finished working through their excess inventory image sensors. Do you think that business can actually be up sequentially in the May quarter, or are you actually seeing the weakness in end demand for handsets, your largest customer now impacting that? From a pricing standpoint, we were relatively flat quarter over quarter. I don’t want to misrepresent that. We are reducing prices as we need to in order to remain competitive, but we are continuing to migrate up in terms of pixel density and those higher pixel density chips typically sell at a higher average selling price. In terms of sequential growth in Q3 versus Q2, it is difficult to say. We still have roughly 60 days left in Q3, so it is really difficult for me to say what is going to happen. What is your revenue mix by product line, CMOS image sensors, NAND, PC and specialty DRAM? We ran approximately 50% in core DRAM, approximately high teens in specialty DRAM, high teens in flash, and as Mike mentioned earlier, about 11% in image sensors. "Micron's business providing image sensors for camera phones -- the company's most profitable product line -- is also under pressure. Micron said image sensor sales declined on both a unit and revenue basis in the second quarter due to a "reduced appetite" for the chips from cell phone handset makers, increased competition and the popularity of less expensive low-resolution camera phones. Micron executives said they probably lost market share in the second quarter, and noted that the image sensor business would have trouble replicating the growth rates it has notched up in past years. Image sensors accounted for a large chunk of Micron's inventory, which increased 16% sequentially to roughly $1.3 billion. And executives acknowledged that it might take the rest of the fiscal year before inventory levels for image sensors come back down to desirable levels." "Micron is the biggest supplier of camera sensors to Motorola, the second-largest mobile-phone maker, according to Jefferies & Co's Lau. Motorola's forecast of a loss for the first quarter has contributed to a ``bleak outlook'' for Micron, he wrote in an April 2 report. Micron also may have lost share in the camera-sensor market to newer rivals including Samsung, Mike Sadler, Micron's head of sales said. The product accounts for 25 percent of Micron's profit, according to Doug Freedman, an analyst at American Technology Research in San Francisco. ``It's going to get worse next quarter before it gets better,'' he said." Reuters: Tower announced today that it was chosen by JPL to manufacture a CMOS image sensor for use in the development of its advanced MultiSpectral Polarimetric Imager (MSPI). The device uses an image sensor process at Tower's Fab1 facility. This design is JPL's fifth submission to Tower, dating back to April, 2001. The previous submissions totaled 28 different designs, with this latest design being the most challenging of the series fabricated for JPL by Tower. Through its airborne and planned space-borne implementation, the MSPI is intended for the study of atmospheric aerosols. A high-speed on-chip 50Msps ADC is 9-bit square-root-encoded, resulting in the equivalent of 14-bit quantization at low signal levels. The imager is said to have a high QE and 10e read noise. EETAsia: In collaboration with Micron, TI offers a reference design that uses Micron's 8Mpixel CMOS image sensor to achieve full 8Mpixel-resolution frame rates in excess of 5fps. In addition, Micron's sensor combined with TI's reference platform delivers a low-power design with 720p 30fps HD-video capability. With this new DSC reference design, ODMs will be able to bring advanced features to the low-cost DSC market. Consumers will benefit from real-time video stabilization, face tracking at 30fps and rapid red-eye removal in less than 0.5s. A high-performance noise filter that processes greater than 10Mpixel in 1s, allows consumers to capture better pictures at high ISO-10000, in low light environments. "Siliconfile Technologies a fabless CMOS image sensor developer of South Korea, announced a 5-million pixel CMOS image sensor, the NOON500 LC50, Digital Times reported on October 18, 2006. According to the company, the NOON500 LC50 is based on 2.25-micron pixel size and 1/2.5-inch optical format. The company added that the new sensor integrated ISP (Image Signal Processing) achieving DSC equivalent image quality in a camera phone. The device also supports Low Light Performance. The new sensor is available on a sample basis. The device is going to be available in the first half 2007. Siliconfile recently debuted the NOON300 PC20, a 3.2-million pixel CMOS image sensor. The image sensor achieving 3 -micron pixel size and 1/2.3-inch optical format is going to be produced on Dongbu Electronics’ 0.18 micron process. Siliconfile has been supplying its flagship 2-million pixel CMOS image sensors to Japan and China actively since 2005. Sanyo Electric of Japan adopted Siliconfile’s 2-million pixel CMOS image sensors in the W42SA, a Sanyo Electric-supplied CDMA 2000 1x EV-DO handset for KDDI (au). The image sensor adopted in Sanyo’s W42SA is 12 mm x 12 mm x 7 mm in size while supporting auto focus. The company plans to offer a wide range of mega pixel CMOS images sensors ranging from 1.3-million to 5-million pixels to compete against the CMOS image sensor leaders such as Micron and OmniVision. Silicionfile achieved 13 billion won ($13.68 million @ won 950.38/$SU 1) revenue in 2005 and hopes to achieve 30 billion won ($31.57 million) revenue in 2006." Worth noting that as of today, 4 months later, Siliconfile web site does not mention these new sensors, not even as PR, let alone product pages.